Unsuccessful attempts to manipulate the mood of opposition during the 2009 presidential election showed to the West that Iran had a very strong political resistance. And the next elected leader, “moderate” Hassan Rouhani revealed that Iran is able to plan its political course for several years (such it was in Russia with the presidential term of Dmitry Medvedev, being under Vladimir Putin, and the USA naively believed that Medvedev had liberal oriented policy). More than a week ago, Ayatollah Khamenei said that all American products would be under the sanctions in Iran and kick out of Iranian market; it is not a usual diplomatic rhetoric, charactering of Western politicians. According to the wishes of many American political scientists and experts on the necessity of Iran's engagement through its economy, such prospects look little bit threatening. 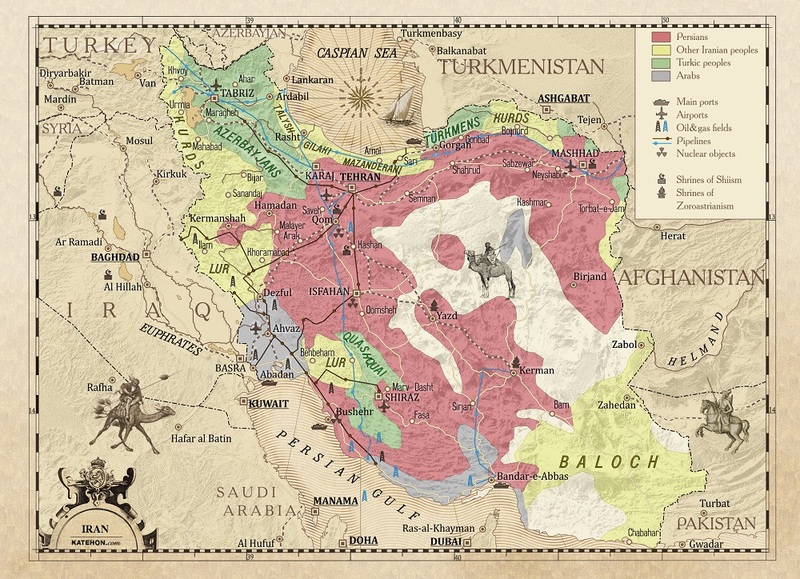 In fact, in the current situation, Iran follows so-called defensive economy, focusing on its internal resources and relying on its autarchy, rather than on foreign markets. However, Iran has some strategic directions such as China, India, Russia and Latin American countries. The recently signed agreement with Russia on more than $2 billion loan and the Iran application for another $5billion export credit shows a fast improvement in relations with Russia, that was faced same issues, as Iran, with Western sanctions. Now two counties negotiate to conduct all transitions on their national currency, showing their mutual desire to avoid dollar dependence. The new contract to supply Iran with S-300 anti-aircraft missile systems entered into force on November 9. Now Iranian experts are trained in Russia. November 23, 2015, the Russian President Vladimir Putin is to take part in the gas exporting countries forum in Iran. This event is a positive for the future of the cooperation between two countries that oppose the neoliberal system expansion. Iran's political system is quite different from the Western model. According to the law, a membership of a party or a political group is not compulsory for Majlis (parliament) members. There are some special quotas for ethnic and religious minorities: Armenians, Assyrians, Jews and Zoroastrians. The Guardian Council of the Constitution is regulating and supervising institution which may limit the number of participating of parties in the elections. So, in 2012, only 3232 from 5405 registered candidates were allowed to participate in the race. As the result, he last 2012 parliamentary elections eight political parties and blocs was admitted, dividing into two alliances: the Conservatives (about 59.7%) and the Reformists (about 35.5%). - Insight and Islamic Awakening Front, led by Shahab od-Din al-Sadr, the vice-Speaker of the Parliament. - Labour Coalition, uniting the Islamic Labour Party and the Iranian Workers' Solidarity Network, led by Hossein Kamali, former Minister of Labour. - Moderate reformers, pro-government reformists, led by Ali Motahari. Ethnic and religious minorities, which must be represented in the parliament, received about 2.1%. As it can be seen, the conservatives are still the majority, but some reformists support the ruling power. Functions of the Iranian President are more formal, as veto powers, including issues of foreign policy, are given to the Supreme Leader of Iran. After the death of Ayatollah Khomeini in 1989, this post is taken by Ayatollah Khameneni. Ayatollah is an honorary title of Shiite theologians (mujtahids) having the right to decide on Islamic law issues based on Jafari Law. Having clergyman in the head of political system shows that Iran is a theocratic republic. An important role in political life is played by Basij (Mobilization), a voluntary associations created by Ayatalloy Khomeini in 197. Basij has now no practically military role and implements social projects and watches society attitudes. Basij has its offices in all large enterprises, universities and other institutions. Basij in some sense is similar to Committees for the Defense of the Revolution in Cuba, which is volunteer organization, but is directly influence the career growth of its active members. Washington pays a close attention to Iran and the current negotiations on the sanctions lifting. On November 5, United States House of Representatives (House Oversight and Governmental Reform Committee, Subcommittee on National Security) presented a report, The Impact of Sanctions Relief on Iran, created by an expert of the RAND Corporation. The author noted that "while the United States will lift secondary sanctions against Iran, primary American sanctions targeting the Iranian regime's support for terrorism and its human rights abuses will remain, preventing Iran from gaining access to American capital, and-most importantly – American technology and know – how ". However, the report notes the importance of the US diplomatic negotiations with Iran, as both countries have the same view on some (the fight against the terrorism, Iraq stability). Also the United States believes that Iran is likely to leave Syria as soon as possible, since the number of casualties is still growing (about 2,000 people of the Army of the Guardians of the Islamic Revolution now on ground in Syria). While Washington is to involve Rouhani into negotiation on many important issues, the United States believes that the really good relations between countries can be established only when Iran become more open and democratic. The US position means changing the political model of the country: removal of the Supreme Leader Ayatollah Ali Khameneni (or his future successor), as well as holding future elections under the Western electoral system. Anyway, it means a change in the Iranian Constitution that is fundamentally impossible because of cultural traditions and national thinking. The US is also increasing pressure on Iran on human rights issues, aiming to maintain efforts to promote democracy in that country for a long time. To achieve it, the USA are to attract more Iranian youth at the US at universities, studying them American values and increasing the cultural, religious and sports exchanges between both countries. As for the EU lifting the sanctions, Iran must fully follow the Joint Comprehensive Plan of Action. Despite the number of concessions that Teheran have already adopted on the issue of changing its nuclear program, the EU and the USA are unlikely to rush to meet their obligations. - Accepting intrusive inspections of Iran's nuclear facilities. However, even the removal of secondary sanctions, which are connected with the oil production and sailings, won’t solve all Iranian economy issues. Increasing oil exports on about 1 million barrels a day, Iran will spend most of its profit to pay debts and investment in infrastructure and social sectors. While oil prices are still low, the country will not be able to become rich quickly: its traditional competitors, the other Gulf countries will put obstacles in the way of Iran, trying to enter the world market. Most likely, Qatar with the support of the USA will try to limit the Iranian gas exports in the coming years. It means that Iran will not be able to build quickly a gas pipeline to China or Europe, using the local conflicts and the pressure on the political elites of the possible transit-countries. Most likely, the United States and Qatar will try to avoid import to Iran of technologies that will allow it to export compressed natural gas. Even it sounds like a conspiracy theory, previous years the assassination of Iranian nuclear physicists may show possible new targets represented by the oil and gas industry experts. It is important to note that the attitude of Iran to the issue is that all the dead scientists are automatically recognized as martyrs that promotes social connections of Iranian society. It is also important to note, the US and Israeli negotiations on Iran. November 9, Washington hosted a meeting between Barack Obama and Benjamin Netanyahu. The US president said a day before that both countries will coordinate efforts to prevent Iran of the further fulfillment of any "destabilizing" activity in the Middle East. The position of Israel Prime Minister was more strict. He said that Israel would not accept any peace agreement on Syria, if Iran used Syrian territory to any direct or indirect aggression against Israel. At the same time, one of the Syrian regions (the Golan) is now occupied by Israeli that is recognized by the UN resolution. And Syria and Iran have an agreement on a common defense. For this week was planned European tour (France, Italy, Vatican) of Iranian President Hassan Rouhani on lifting the sanctions. After the terrorist attacks in Paris the visit was cancelled. Other countries haven’t given yet any of their requests. It is clear that Germany will be the first, trying to gain any benefit from the sanctions lifting, taking part in a variety of projects of the Iranian economy. Already many German businessmen going to Iran for different deals. It is possible that Washington will use its influence to Berlin to indirectly achieve their interests. Taking into account the actual economic war between US and Tehran, the use of a third party is the only way to the White House for engaging Iran in its orbit. It is hardly to expect any beneficial talks between Iran and European politicians, as, in the wide geopolitical turbulence, all the players are trying as much as possible to maintain its interests. In addition, some of the EU countries have close relations with the Gulf monarchies that automatically show anti-Iranian position on the Syrian and Yemeni conflict. Although such views are not necessarily promoted, the current balance of power in the EU shows that in the countries, even if the business community wants to work more closely with Iran, they will act very carefully with caution on the possible consequences.